Montana is better off economically than many other states, but it still has a ways to go in restoring and adding services that Montanans need. That was the message Gov. 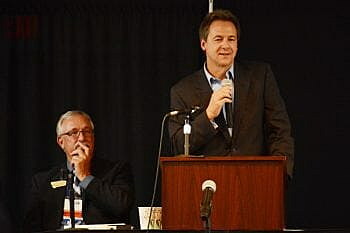 Steve Bullock gave to county commissioners attending the annual conference of the Montana Association of Counties on Wednesday afternoon in Missoula. Bullock rattled off several metrics that show Montana is excelling, including this year’s unemployment rate being the lowest since the recession; being ranked third in the country over the past five years for the highest total value of goods manufactured, known as GDP; having the fourth fastest wage growth in the country over the past decade; and leading the country in middle-class income growth over the past four to five years. The problem is that some of the budget cuts that went into effect this year put rural areas at a bigger disadvantage because the cuts eliminated jobs and services that less populated counties depend on, including essential services of the Department of Health and Human Services. Those cuts were the result of a special legislative session Bullock had to call last year to redistribute state funding after wildfire suppression sucked $70 million out of the general fund. As if to demonstrate the problem, a representative from Rosebud County asked Bullock if he could keep the Revenue Department office from closing in Rosebud and other counties, so the county could bring in more revenue. Bullock said he could only do so much; he needs people to let their legislators know what’s important. Related to health care, Ballot Initiative 185 is a looming issue that the people will decide before the 2019 Legislature meets, and the outcome will have an effect on the tone of the session, Bullock said. I-185 would increase the tobacco tax and use the resulting revenue to fund the expanded Medicaid program approved by the 2015 Legislature. Otherwise, expanded Medicaid will sunset in 2019. Bullock said the expanded Medicaid program has provided 10 percent of Montanans with health care they otherwise wouldn’t have. Because a number of those Montanans live in rural counties, expanded Medicaid has a side benefit of helping keep rural hospitals open, a fair number of which are the biggest employers in some counties. If I-186 doesn’t pass, some of those hospitals could close. Bullock highlighted other programs and services he would probably include in his budget to be released in November. They include the state’s colleges, the apprentice program, criminal justice reform and stronger campaign finance laws. But he gave special emphasis to the need for a rainy day fund. Prior to the 2017 wildfire season, the state had managed to adequately support its agencies while keeping about $300 million in reserve. Bullock said 2017 was the perfect example of why Montana needed to have a rainy day fund. Even though budget cuts were made, the fund allowed the state to remain solvent after a crisis, unlike New Jersey or Oklahoma. Bullock said Montana Republicans and Democrats may disagree on certain overarching principles, but they’ve often been able to compromise on individual issues important to Montanans. The key to the next Legislature is being creative about increasing revenue to fund the services the state’s residents need, he said. “I’m optimistic that, come January, legislators will come to Helena, roll up their sleeves and work with me to identify the next steps to not only get on the right path the next biennium but to also think beyond the next couple years about how can we move forward as a state,” Bullock said.